The shaking ground in Christchurch, New Zealand, sent the city’s population of 350,000 scurrying for safety on Tuesday morning as buildings collapsed and the ground buckled. 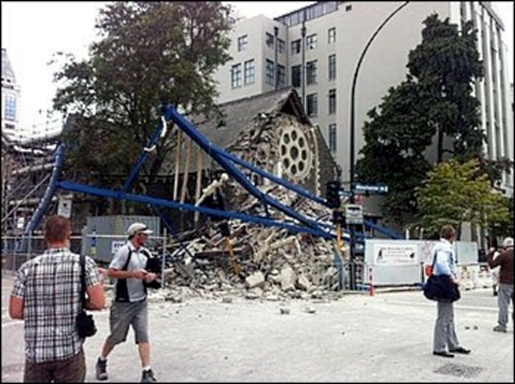 Christchurch’s historic cathedral toppled to the ground. Buildings crumbled. The Christchurch earthquake has left an estimated 65 people are believed to be dead, and hundreds more are trapped in ruined buildings, waiting for rescue after a 6.3 earthquake struck just after 1 PM local time on Tuesday. This is the second earthquake to rock Christchurch in the last five months, though this 6.3 earthquake did far more damage than September’s more powerful earthquake. The September quake hit at dawn on a weekend morning; this quake struck in the heart of the business day during the busy tourist season. Another factor that increased this particular disaster is the location: this quake occurred only about 3 miles from the city and was only about 2.5 miles underground, making it very close to the population center. Two large aftershocks hit only an hour after the first tremors, one 5.6 and one 5.5, which didn’t help already damaged buildings.